In 1954, with the Corvette on the verge of being discontinued indefinitely, a “stay of execution” emerged from the unlikeliest of places. Historically, it is well known that General Motors and Ford Motor Company have always shared more than a friendly rivalry. In many instances, the actions of one company were often guided, sometimes even dictated, by the actions of the other. 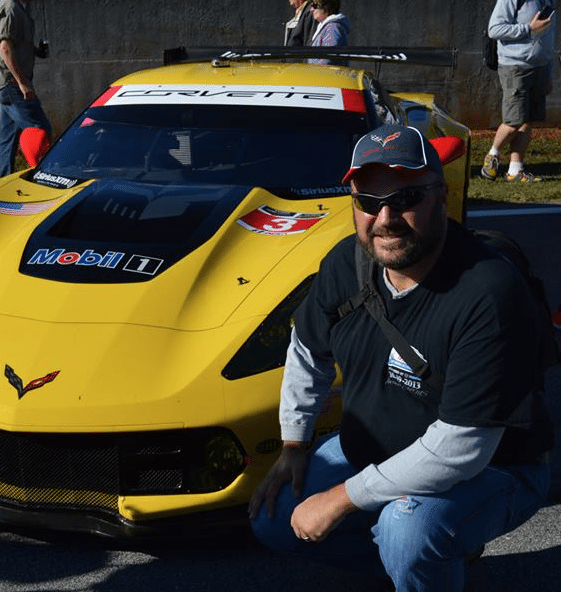 So it was with the Chevrolet Corvette. Engine: “Blue Flame” Inline-6 or 265-cid small block V-8. Edward Cole’s newly engineered 265-cid V8. Ford Motor Company introduced the Thunderbird on September 23, 1954. This car, like the Corvette, was a two-seater that was being marketed as more of a “personal car” than an actual “sports car”. Still, the Thunderbird had a lot of personality and flair. It was a car that had handsome lines, and came standard with a V-8 engine and the option for either a manual or an automatic transmission. Compared to the competition, the Ford Thunderbird was plush, and far more luxuriously appointed – yet still managed to carry a price tag of only $2994.00, making it less expensive than the Corvette. General Motor’s corporate pride was on the line. 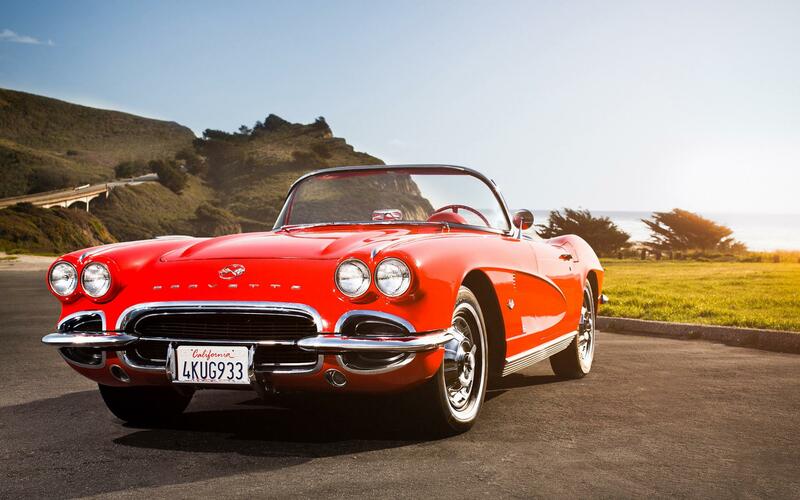 While there had been some question as to the long term viability of the Corvette, the arrival of the Thunderbird ended any discussions of terminating Chevrolet’s sports car. 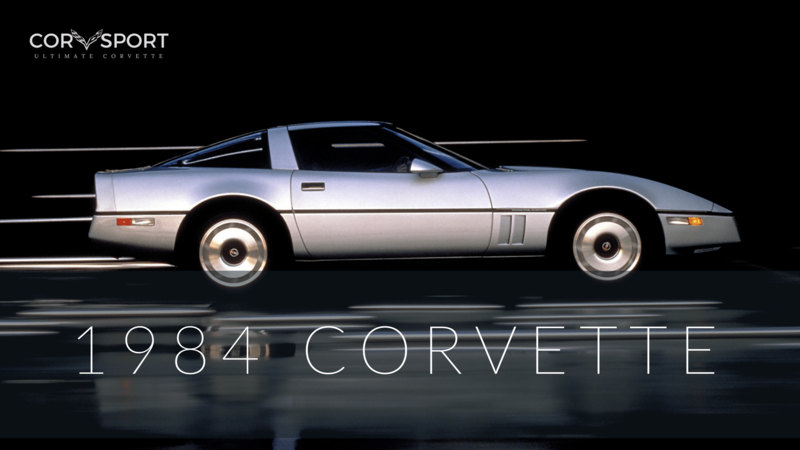 Instead, fueled by the natural competitiveness between the two companies, General Motors executives and engineers were bound and determined to let the Corvette become the car it was meant to be. Edward N. Cole, Chief Engineer for GM’s Chevrolet Division, was prepared to lead this process. He had developed a new power plant that was ready for production which would, ultimately, play a pivotal part in the re-birth of Corvette into American culture: the amazing new 265-cid small-block V-8. 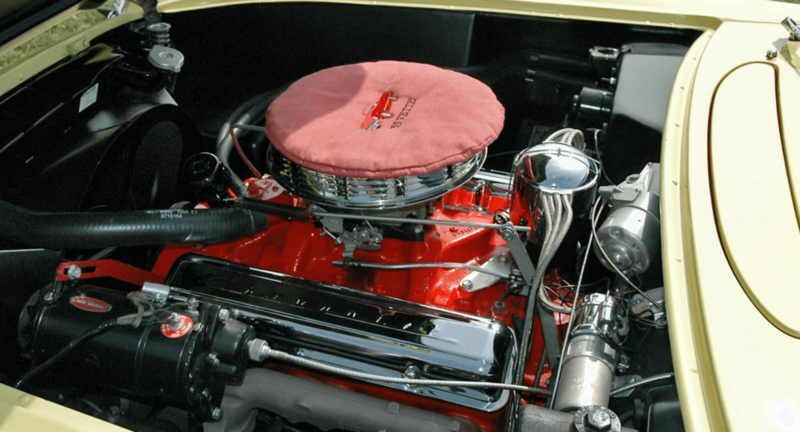 This engine, which he had been developing for Chevy’s totally redesigned passenger cars, would become the “heart and soul” of the 1955 Corvette. The original intent of the 265-cid V-8 was to have a capacity of 231 cubic inches, which made it physically smaller than the “Blue Flame” six cylinder of the 1953 and 1954 Corvette. It was Edward Cole that had the engine’s capacity increased to 265 cubic inches. Cole also reworked the cylinder heads, concentrating on efficient gas flow and better combustion. Upon completion, this V-8 engine was 300lbs lighter than the ‘Stovebolt Six” and was a remarkably compact unit. 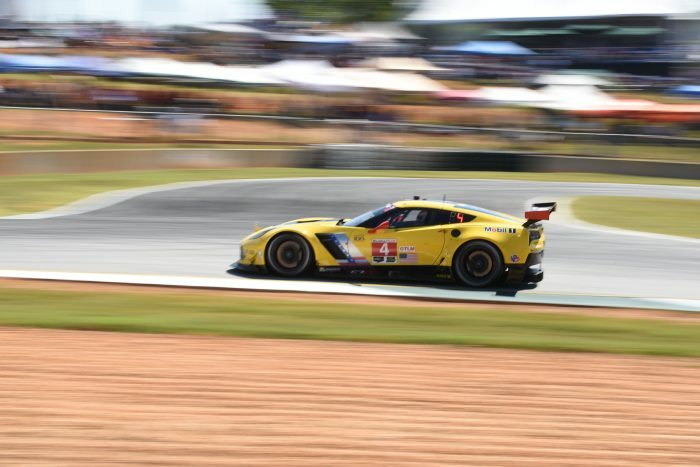 The inclusion of a short-stroke crankshaft allowed the engine to rev to 6,000rpmAt about the same time, a new member had allied himself with the Corvette engineering team. Zora Arkus-Duntov had joined General Motors in 1953 after seeing the Motorama Corvette on display in New York. While he had found the car to be visually stunning, he had been immensely disappointed by what the car offered in the way of handling and performance. Duntov, who had formerly worked for companies including Porsche and Mercedes-Benz, was 45 years old when he joined the Corvette family. He knew what an American sports car should be, despite his European heritage. 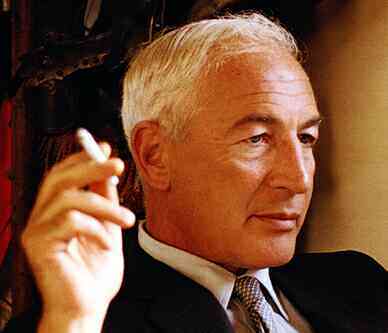 After all, Duntov was a veteran race car driver, automotive designer and engineer. Upon joining the GM Reseach and Development Staff, Duntov quickly became known for continuously “fiddling” with Corvettes in his spare time. He knew exactly how and what Corvette was lacking and, likewise, knew how to correct it.>There are many stories of Duntov’s involvement in the refinement and development of the Corvette. It was these type of minor, but significant, changes that would eventually cause Duntov to emerge as a legend both amongst GM insiders and Corvette enthusiasts alike. For some, he would even become known as “The Father of the Corvette”, a title originally reserved for Harley Earl. Despite the addition of Duntov and the arrival of the Ford Thunderbird, there was still some question as to the future of the Corvette. 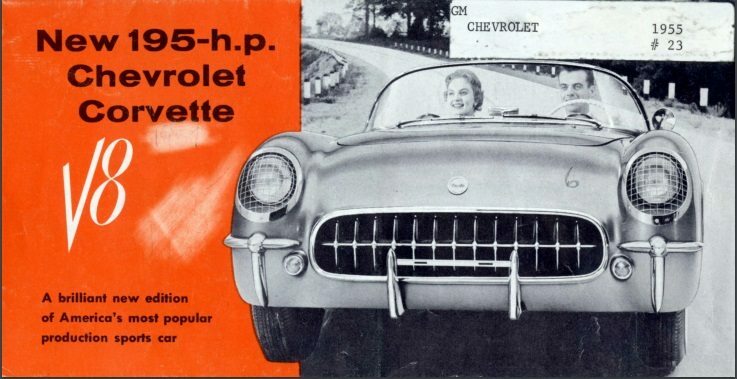 Harley Earl, who was still very much committed to his Corvette, proposed that the car be given a new look with a wide, egg crate grille similar to those that were coming out on Chevy’s new passenger cars. He also recommended the addition of a functional hood scoop, dummy front-fender vents and a redesigned rear deck with outboard exhaust tips. Ultimately though, GM decided against the changes, due mostly to the high cost of tooling combined with the utter lack of Corvette sales. 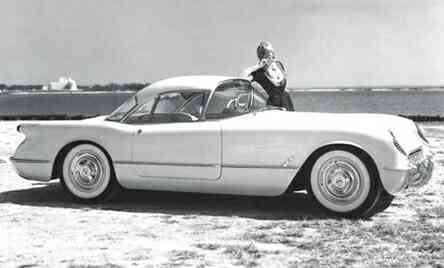 The 1954 Lift-Off Hardtop Corvette Concept (Photo Courtesy of GM Media). Sadly, this general lack of funds also ended further development of two follow-up concept cars that Harley Earl had designed around the Corvette platform for the 1954 Motorama Tour. The two designs included a lift off hardtop that transformed the Corvette into an attractive, thin-pillar coupe. The other design was a closed fastback coupe. The 1954 Chevrolet “Corvair” (also known as the Corvette Fastback Concept). (Photos Courtest of GM Media). Ironically, the Motoroma fastback coupe was nicknamed “Corvair”, which was actually one of the names that had been seriously considered and favored over Corvette. While neither car ever made it to production, General Motors would later go on to develop another production vehicle that would carry the name “Corvair”, although the car would become a source of embarrassment for an entire generation of GM executives and engineers. From an outsider’s perspective, the 1955 Corvette was simply a repeat of the 1953 and 1954 models. However, upon closer inspection, it was apparent that the car had been improved considerably. The single biggest improvement was the addition of the optional small block V-8 engine that Ed Cole had designed. 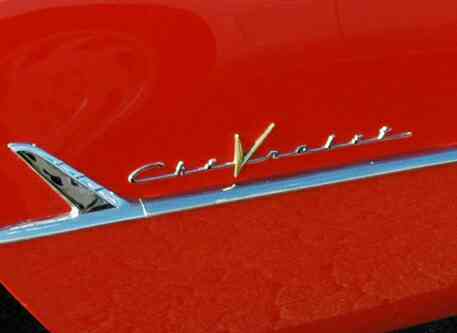 The exaggerated gold “V” in the Chevrolet Logo indicating the 1955 Corvette was equipped with a 265-cid V8 engine. Optioned for an extra $135, all but six of the 1955 Corvettes built included this bigger, stronger engine. As an identifier that these new Corvettes contained the larger engine, an exaggerated gold “V” was overlaid on the existing “CheVrolet” logo on the lower front fenders. The car also included a broader radiator grille. Some of the engine’s many features included an intake manifold that provided a common water outlet to both heads, which were diecast with integral valve guides and were completely interchangeable. Hollow pushrods were introduced that allowed oil to circulate through them, providing splash lubrication to the rocker arms and valve stems while simultaneously reducing engine weight by eliminating the necessity for costly oil feeder lines. Modern, slipper-type, “autothermic” aluminum, three ring pistons were used. A circumferential expander for the single oil ring provided axial and radial force to control oil burning. The engine crankshaft was forged of pressed steel (instead of iron) because of it’s “higher gravity and modulus of elasticity.”Perhaps one of the most interesting and relevant innovations of the 265 engine was the development of individual rocker arms in place of a single, common rocker shaft. Each rocker arm was completely independent of the others, which meant that the deflection of one had zero effect on any of the others. Each was assembled over a valve stem and pushrod and was retained by a fulcrum ball and lock nut. While this type of rocker arm is common today, in 1955 the design was considered completely innovative and represented a pivotal turning point in the development of internal combustions engines. The new V-8 engine did wonders for the Chevrolet Corvette. DID YOU KNOW: As late as 1955, there were still many individuals within General Motors who felt that the name “Corvair” should have been used in place of “Corvette”. Ed Healey’s 1954 Fastback Concept carried the name “Corvair” and might have gone to production had it not been for the incredibly poor sales of Corvette from 1953-1955. While the concept car is not available for viewing anywhere, the Corvette Corvair was rumored to have survived the crusher, though no trace of it has shown up. While the engine was essentially the same as that being used in many of Chevy’s passenger cars, the Corvette version ran a special camshaft that produced an additional 33 horsepower above standard tune – resulting in a total of 195 bhp at 5000 rpm. The maximum torque was 260lbs. ft. at 3000 rpm. Another important change was the replacement of the three, carburetors used on the “Blue Flame” six cylinder with a single Rochester four-barrel carburetor The V-8’s higher rev limited resulted in a revised tachometer with a redline of 6,500 rpm. Because the engine was lighter than it’s predecessor (despite being larger), the fore/aft weight distribution of the car improved to a 52/48 ratio.The new Corvette’s improved performance was unmistakable. The addition of the V-8 engine resulted in 0-60mph times of just 8.5 seconds and quarter mile times of only 16.5 seconds (which was a considerable accomplishment in 1955). The Corvette’s was now capable of reaching top speeds of nearly 120 miles per hour while actually getting better gas mileage (an average of 2-3 miles per gallon) than that of the standard “Stovebolt” six cylinder engine. Of course the refinement of the car was not limited solely to the engine, although the addition of the V-8 certainly encouraged other accommodations to be made to the car. For the first time since the original 1953 Motorama Corvette, an automatic choke was included as well as a modern 12 volt electrical system, though the older 6-volt system was retained for the few six-cylinder Corvettes that were built that year. Electric wipers replaced vacuum-operated units and foot operated windshield washers were included. 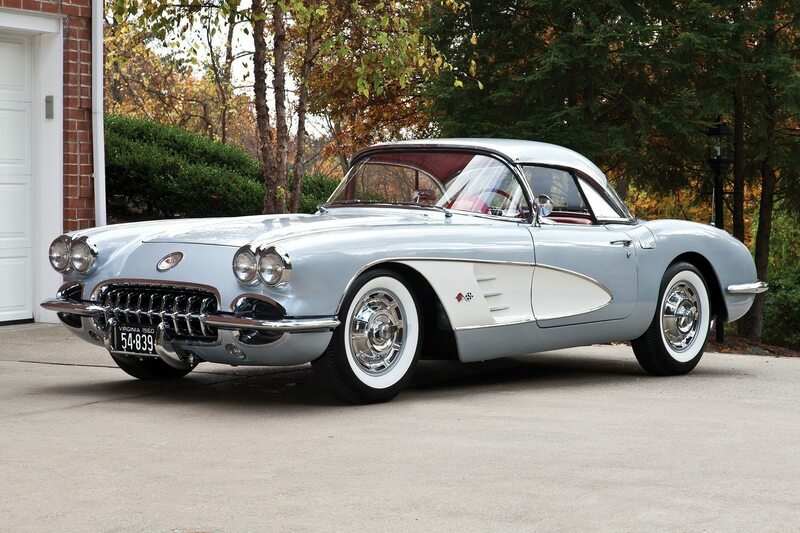 Tires changed from tube type to the tubeless variety and were available in both white wall and black wall versions.Although the Powerglide two-speed automatic remained for most of 1955, about 75 cars were built with Corvette’s first manual gearbox. This was a new close-ratio three-speed manual transmission which was shifted via a stubby chrome shifter rod capped by a small, white ball and surrounded by a boot that was clamped to the floor by a bright metal ring showing the shift pattern. 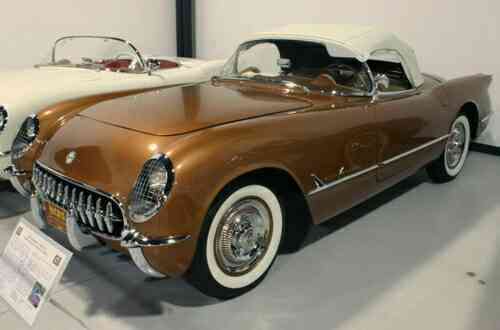 The 1955 Corvette in Harvest Gold. 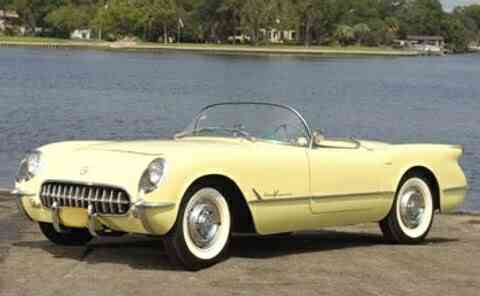 As in the 1953 and 1954 models, the Corvette received several running changes during it’s 1955 production. Soon after start-up, the Pennant Blue color option was replaced by Harvest Gold, with contrasting green trim and a dark green top. Metallic “Corvette Copper” (a bronze color) with a dark beige interior was also made available, and Sportsman Red was replaced by Gypsy Red, which came with white vinyl interior, red saddle stitching and tan carpeting and top. 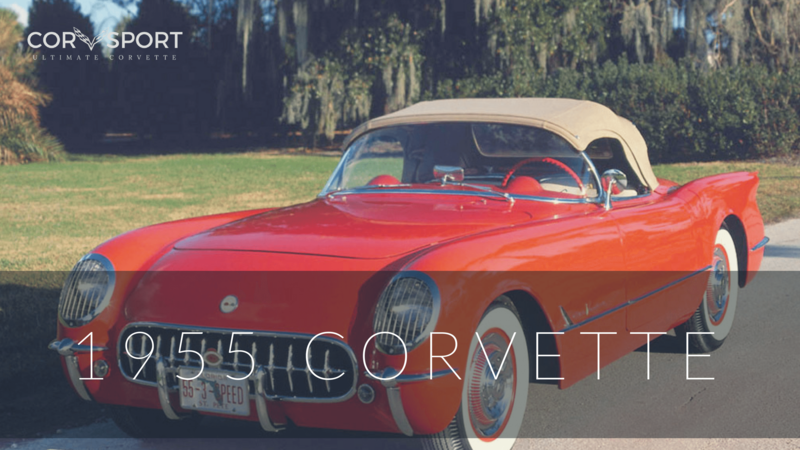 The 1955 Corvettes were constructed of slightly thinner sections of fiberglass. As the process evolved, the fit and finish of these individual parts became tighter and tidier than on either of the earlier models. 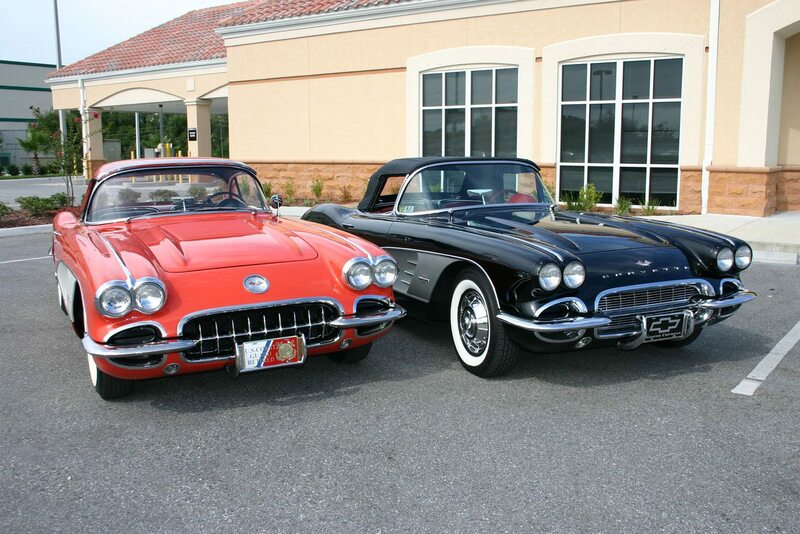 What’s more, the 1955 Corvettes had smoother bodies than either the 1953 or 1954 models. Beneath the surface, changes occurred as well. The early 1955 models retained the mounting holes in the frame rails for the six cylinder engine but these were soon plugged as it was already known that they’d probably never be used again. The 1955 Corvette in Corvette Copper (with dark beige interior). 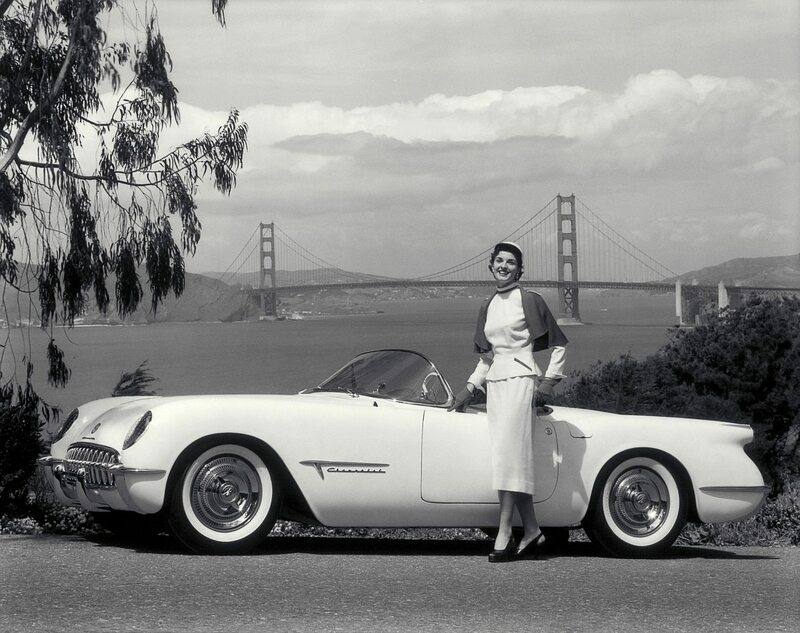 As a whole, 1955 marked a pivotal year for the engineering behind the Corvette, despite the fact that sales continued to be an overwhelming failure. In 1955, only 700 were produced by GM for the model year and of these, only 674 were actually sold. It appeared that GM had learned from their previous model years over-production mistakes. The fact that Corvette was not dropped from production right then and there demonstrated again just how powerful the adversarial nature of the relationship between General Motors and Ford really was. For it’s own part, Ford had stirred up a rousing success with the addition of the Thunderbird to it’s fleet of available vehicles. In 1955, Ford succeeded in selling 16,155 Thunderbirds for the model year – a 23 to 1 margin over the Corvette. Ford Motor Company's 1955 Thunderbird. (Photo courtesy of Old Cars Weekly). FUEL DELIVERY: Three Carter Sidedraft Carbs. Front Tires: 6.70 x 15 inch, 22 psi. Rear Tires: 6.70 x 15 inch, 22 psi. V (First Digit) Identifies the installation of a V-8 engine. For 6 cylinders, the “V” is omitted. E (Second Digit) General Motors Identification Code for Chevy Corvette. S (Fifth Digit) Location of the Assembly Plant. S – St. Louis, Missouri. The last three digits begin at 1001 and run thru 1,700, accounting for each of the 700 Corvettes built in 1955. Each Vehicle Identification Number (VIN) is unique to an individual car. For all 1955 Corvettes, the location of the Vehicle Identification Number (VIN) is located on the driver side door post. The VIN is also stamped on several locations on the Corvette frame. The base price of the 1955 Chevrolet Corvette with a 6 cylinder, :”Blue Flame” Engine. The base price was effective October 28, 1954 and remained the same throughout 1955. The base price included federal excise taxes. Prices did not include local taxes or any additional dealer charges. With the exception of the introduction of the V-8 Roadster, the 1955 pricing was the same as 1954. This base option price included a 235 cubic inch, 155 horsepower 6 cylinder engine, 3-speed manual transmission, vinyl interior trim, and a soft top. Despite the included 3-speed manual transmission coming standard, the Powerglide automatic transmission was a required option. There is no known documented 1955 Chevrolet Corvette that includes a 6 cylinder engine mated to a manual transmission. Tachometers for this model read to 5,000 rpms in 500 rpm increments. The base price of the 1954 Chevrolet Corvette with a V-8 Engine. 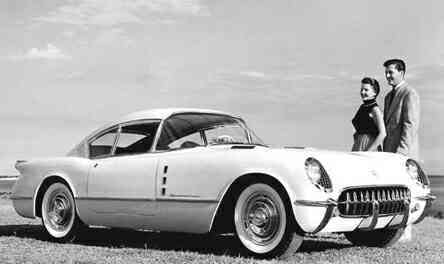 While the V-8 was almost universally installed in every 1955 Corvette, records indicate that seven Corvettes were built with 6 cylinder engines during the 1955 production year. This base option price included a 265 cubic inch, 195 horsepower V8 engine, 3-speed manual transmission, vinyl interior trim, and a soft top. Despite the included 3-speed manual transmission coming standard, the Powerglide automatic transmission was a required option until the middle of the production year when the manual transmission started to be used. Corvettes with the V8 engine were (and are) identified by a large gold “V” that overlays the small “v” in the “Chevrolet” script on both front fenders of the 1955 Corvette. 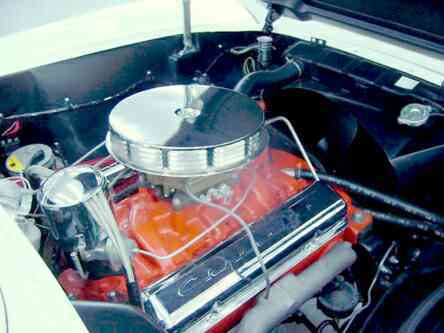 The V8 included chrome plated valve covers with the “Chevrolet” script stamped on them. Tachometers for this model read to 6,000 rpms in 1,000 rpm increments. Also known as a turn signal, it is a switch-controlled light that indicates when a car is about to turn. The heater was not a fresh air type heater. The heater only recirculated interior cockpit air. Was the same for both the six cylinder and eight cylinder options, except for modifications to the blower motor to accommodate the different voltage between the two models. Radio antennas were standard in all 1955 Corvettes. The antenna consists of a wire mesh screen fiberglassed into the interior lining of the trunk lid. Because fiberglass is electrically inert, this solution provided a way of concealing the antenna without creating radio interference. Tires were changed late in 1954 production from tube type to tubeless, though it is believed that both types were available (and used) for a limited time period. By listing the Powerglide automatic transmission as an option, it was implied that a manual transmission was included as standard equipment. This is not true. Every six cylinder 1955 Corvette had an “optional” Powerglide transmission installed (and was added to the sales price of the “base” model Corvette.) The same is true for the V8 models, although General Motors did eventually begin installing manual transmissions by the middle of the model year. 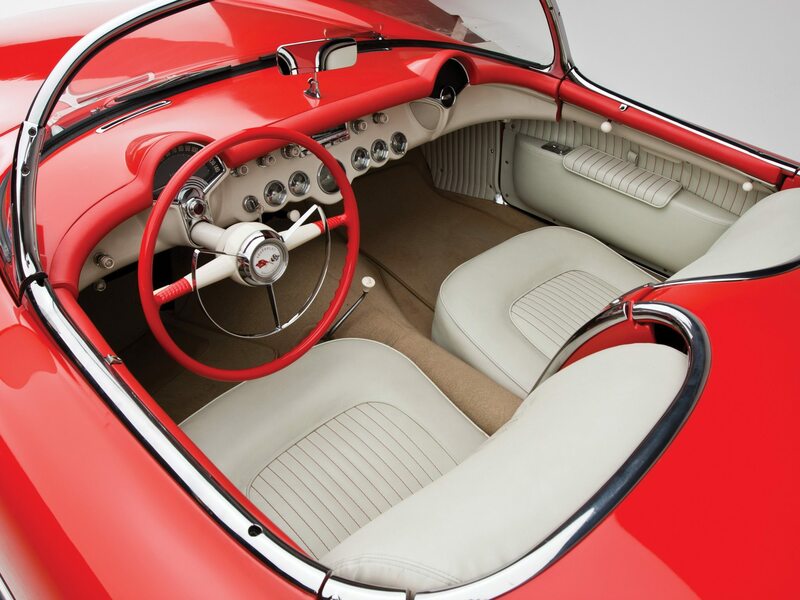 The windshield washer systems of the 1955 Corvette were vacuum-operated. It was activated by pressing a floor pedal with coordinator. 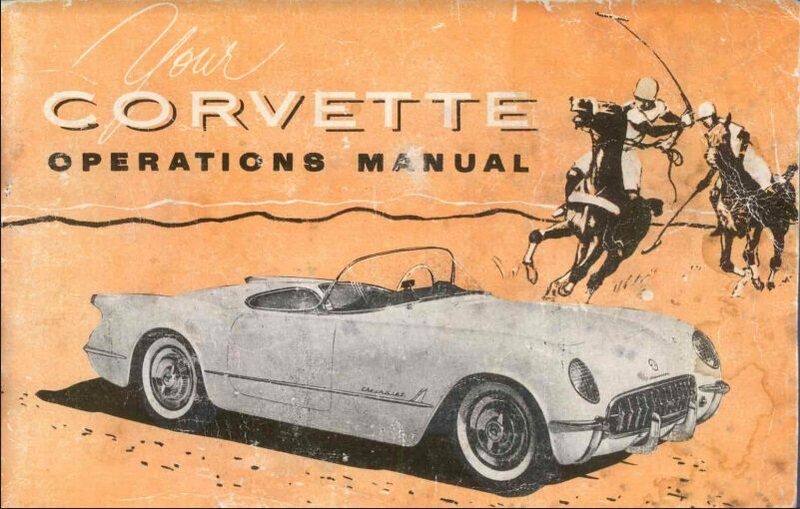 You can download for free this exclusive 1955 Corvette User Manual for more information about the car. 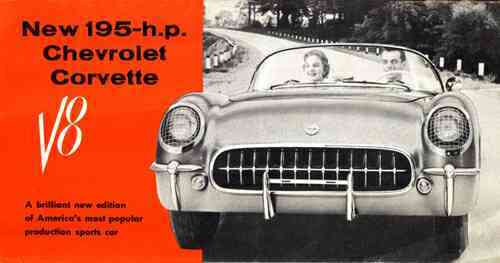 Download this 1955 Corvette Dealers Sales Brochure for a quick look at the features of the car.